Imagine: putting principle before money. What’s this—a candidate for attorney general who wants to keep candidates like himself from accepting campaign donations from public utilities? Talk about acting against his own financial interest. . . and merely because the attorney general is bound by law (and, we hope, conscience) to represent the consumers against the utilities in rate cases. Gunner DeLay clearly has some new and strange ideas. He’s a Republican, which may explain it. The former state senator from Fort Smith clearly doesn’t know how things are done in this state, and have been done for years. 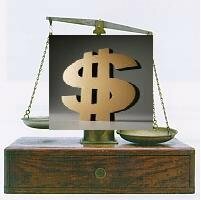 When it comes to choosing between an abstract principle and real money, cold cash has long held the advantage. The Democratic candidates don’t seem to have any big problem taking money from the utilities. What conflict of interest? Taking the money isn’t going to affect how they deal with the utilities, or so they assure the public. There’s something unsettling about folks so sure of their ethical probity that they don’t mind being led into temptation. But what th’ heck, this is the kind of arrangement that’s been accepted for so long in Arkansas politics—the way the one-party system used to be—that it sounds strange even to hear a candidate question it. Imagine: putting principle before money. What kind of politician can this DeLay fellow be? It’ll be interesting to see how a candidate for attorney general with such strange new ideas fares as the campaign heats up. Choosing an ethical principle over a campaign contribution? We all know Arkansas politics has changed over the years, but has it changed that much? Gov. Mike Huckabee on Thursday night lambasted the profit levels of oil companies, saying they “are stealing from absolutely the poorest people.” He also suggested the Legislature enact a uniform pay scale for school superintendents in the state. “There’s no excuse, there’s no reason that they [oil companies] should be profiting at that level when everyone else is suffering the consequences,” the Republican governor said on his monthly television call-in show on the Arkansas Educational Television Network. “It doesn’t make sense that somehow this one sector of the economy is recording their highest record,” said Huckabee, who is weighing a possible bid for the presidency in 2008. Market forces are one thing, he said. But “there’s a point at which you cannot continue to just gouge people because you can, because they don’t have an option,” Huckabee said. “That’s not a market. That’s an immoral force,” he said. “We need to find out; if these folks are gouging, then maybe a few executives need to do a few hours’ community service in the Ninth Ward in New Orleans cleaning it up,” Huckabee said. Huckabee’s remarks came after The Associated Press reported that Exxon Mobil Corp. rewrote the corporate record books Thursday as the oil company’s third-quarter earnings soared to almost $10 billion, and it became the first public company with quarterly sales topping $100 billion. Royal Dutch Shell PLC posted a profit of $9 billion for the quarter, and Marathon Oil Corp. said its profits more than tripled. With the state Supreme Court weighing the masters’ report that concluded that the 2005 Legislature and Huckabee backtracked on educational reforms enacted in 2003 and 2004, the governor said the Legislature should enact a statewide pay scale for school district superintendents if the superintendents continue to sue the state and make the state responsible for all decisions. The masters’ report, issued Oct. 3, said that the state erred by freezing per-student public school funding at $5,400 this school year and by not doing enough to improve school facilities. 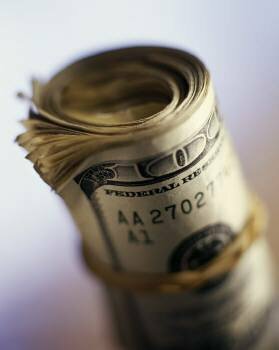 The masters said more money for education could be allocated from state surpluses during a special legislative session if Huckabee chooses to call one. A statewide pay scale for superintendents could have an entry-level salary and pay more to those with a master’s degree and more to those with a doctoral degree, Huckabee said. The pay scale for a superintendent also could be based on the number of students in the districts and the size of the district’s budget, he said. “Right now there is no rhyme or reason to the superintendent pay scale and there ought to be some limitation, maybe no more than three or four times what your teachers are paid,” Huckabee said. “If the [state] Supreme Court puts us in a situation where we end up having to have a special session, look for those kind of things to be brought up and passed because I think there is a sense of utter frustration,” Huckabee said. Last year the House Education Committee rejected a bill that would have limited school superintendents’ guaranteed salaries to 75 percent of average pay during the 2002-2003 school year and make more pay contingent on performance. The Arkansas Times is reporting that Ann Coulter is scheduled to speak at the University of Arkansas - Fayetteville in early 2006. Speaking of Ann Coulter, did anyone watch the Today show this morning? Republicans have taken a proper 'respect for the process' stance when it comes to Patrick Fitzgerald's investigation. This of course was a far cry from the treatment Ken Starr received where he was painted as an overzealous prosecutor by Clintonistas and the media. The Today show was one of the many willing participants in the Starr bashing and thanks to Ann Coulter for pointing out that double standard. Lauer: "We know the President has gone on the record. He said to me that he thinks the special prosecutor in this case is handling the investigation in an extremely dignified manner. So if indictments do come down how do Republicans react? Can some of them say this was all a sham?" Ann Coulter: "And by the way I do not think Republicans will do what Democrats did, we certainly haven't so far, and that is start attacking the prosecutor before we know what the charges are." Lauer giving Fitzgerald the leeway Starr never received: "It's hard to attack this prosecutor at this particular moment wouldn't you agree?" Coulter fired back: "It was hard to attack Ken Starr! He was a boy scout!" "Leak Investigation: Dirty Politics Or Broken Laws?" www.newsbusters.org - October 27, 2005 - 10:50. Face it — the days of $1 gas are over. Today gas prices are well over the $2 a gallon mark, but seem to vary from town to town. White County has some of the highest gas prices in the state which has forced residents to travel further to get gas at a cheaper rate. This high rate has many people asking — Why are the gas prices so high in White County? Gasoline distributors in Searcy aren’t talking about why White County motorists drive to Cabot when their gas tanks begin to show empty. The reason that gas prices in Searcy exceed gas prices in nearby Cabot — and the state average in Arkansas — remains a mystery to most in White County. Searcy Mayor Belinda LaForce said she has noticed the trend but is not sure what is behind it. A gallon of regular unleaded cost an average of $2.67 on Wednesday, a full 14 cents higher than the state-wide average. Across the state regular gas prices are $2.53, according to a AAA daily fuel gauge report. In nearby Cabot, which is a haven for White Countians seeking cheaper gas prices, regular gasoline cost $2.46 a gallon Wednesday, according to a survey. Gasoline in White County is distributed by a few key businessman, all of whom either declined comment or did not return calls for comment. Bobby Reynolds, of Reynold’s Oil and Tire Co., did not return calls for comment. Shell Blakely of B-B Oil Co. Inc. did not return calls for comment. Rick Kent of Mid-State Distributing did not return calls for comment. Representatives of Stephenson Oil Co. refused to comment why prices in Searcy exceeded prices elsewhere. Robert Allison of Allisons Convenience Stores said he did not understand why the community is so interested in his gas prices. Murphy Oil USA Inc. spokesperson Mindy West said that she was neither able nor willing to discuss her company’s gas prices in Searcy. Some White County residents have stopped buying from stations in White County in favor of driving to cheaper filling stations. At the Murphy Oil station off Highway 167 in Cabot, White Countians can be found purchasing gasoline at $2.39 a gallon on Wednesday. The Murphy Station at Searcy’s Wal-Mart complex sold gasoline for as high as $2.66 on Wednesday. At the Murphy station in Cabot, citizens of Searcy are more willing to speculate on what might make gas prices in Searcy higher than they are twenty five miles down the freeway. John Harris of Searcy said he suspects the Searcy gas stations are working together to keep prices high. Harris said he also purchases fuel in Cabot. White County Judge Bob Parish said that he sees the exodus of motorists from White County as potentially harmful to the county’s economy. People do not only purchase gas when they reach a filling station, but often buy snacks and groceries. When those purchases are made in White County, county government collects sales tax revenue. When those purchases are made in Lonoke or Pulaski County, White County makes nothing. Parish himself said that rising gas prices have driven him to occasionally fill up his tank in Bee Branch, where he has found a particularly cheap filling station. “They talk about the war in Iraq and they talk about gas prices in Searcy, Arkansas,” Parish said. Harris said he doesn’t understand why Attorney General Mike Beebe hasn’t spoken out against gas prices in Searcy. The state government does not have a regulatory board tracking gas prices. The Attorney General’s office is responsible for investigating unfair trading practices, particularly when Arkansas is under a state of emergency, said Attorney General Mike Beebe spokesperson Matt DeCample. DeCample said that the Attorney General’s office is currently investigating complaints of price gouging at gas stations throughout Arkansas in the wake of Hurricane Katrina and Rita. DeCample declined to say whether Searcy’s gas stations were a part of the investigation. DeCample did say that the Attorney General’s office received several complaints of unusually high gas prices from White County residents this week. 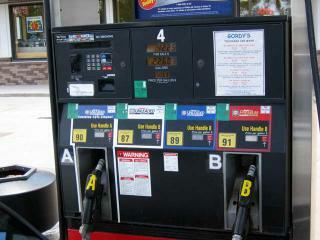 Throughout the state there are stations selling gas at higher prices than Searcy’s stations. Topping that list is Bald Knob. The Citgo station on Highway 367 sold the priciest gallon of regular gasoline in all of Arkansas earlier this week, according to gasbuddy.com. The average price for regular unleaded gas in Bald Knob over this period was $2.79 a gallon. Seven of the 15 most expensive filling stations in Arkansas earlier this week were located in White County, according to gasbuddy.com. The Democrat Party continues to defend radio ads attacking John Boozman for not protecting Arkansans against gas prices and receiving $1,000 donation from ExxonMobil in 2004. This is an example of the Democrat Party's hypocrisy in accusing one elected official when the other elected officials have done the exact thing. As The Truth mentioned before, Blanche Lincoln received $17,000 in 2004 from ExxonMobil, Shell and Murphy Oil. The Democrat Party has not said one word against her. They continue to attack John Boozman relentlessly for taking this $1,000 contribution. The Truth calls on the Democrat Party to stop their hypocrisy and apologize to Congressman Boozman. Jason Willett needs to get a better grip on his "party" and start showing leadership by calling on the Washington County Democratic Committee to STOP their hypocrisy. Democrats defend their ads attacking an Arkansas Republican congressman for accepting money from Exxon Mobil Corp., but do not mention that Democratic members of the state’s congressional delegation have accepted oil money, too. Washington County Democrats began running a 60-second radio spot Oct. 17 accusing U.S. Rep. John Boozman of siding with oil companies at consumers’ expense. It contended Boozman voted against stiffer penalties on oil corporations that gouge consumers after he accepted money from Exxon Mobil. The ad is silent on how much Boozman received and when. According to Federal Election Commission records, Boozman accepted $1,000 from the Exxon Mobil Corp. Political Action Committee in April 2004. The ad contended that Boozman “did nothing” to protect Northwest Arkansas families when gas prices hit first $1.50, then $2 and finally $3 a gallon. The ad mentions forecasts of higher home-heating costs this winter before urging listeners to call Boozman and tell him to help stop rising fuel costs. Boozman’s spokesman, Patrick Creamer, has said it was disingenuous for the county Democrats to say the congressman isn’t doing anything about gas prices when they simply disagree with his approach. On Oct. 7, Boozman voted along with other Republicans for House Resolution 3893, which he believed would more quickly get oil refineries operating again. No Democrats voted for the successful version of the bill, designed to spur refinery construction by softening some environmental restrictions. Boozman voted against the Democrats’ substitute bill, which would have given broader authority to the Federal Trade Commission to crack down on price gouging. The Republican Party of Arkansas accused Democrats of “spreading half-truths” about Boozman. “Key Democrats, including members of the Arkansas Democratic leadership, have accepted much larger donations from oil and gas companies,” the GOP said. Arkansas Democrats in Congress have accepted more than $150,000 in contributions from “big oil and energy” and gas companies since 2001, the Republicans said. The Republicans contended that U.S. Sen. Blanche Lincoln accepted $112,500; U.S. Rep. Mike Ross, $16,345; U.S. Sen. Mark Pryor, more than $15,000; and U.S. Rep. Marion Berry, $6,262. This is especially true in Northwest Arkansas, she said, where companies like trucking giant J.B. Hunt are extraordinarily affected by gasoline costs. Spokesmen for the Democrats said the contributions don’t compromise their service to constituents. Drew Goesl, spokesman for Lincoln, said many things determine Lincoln’s votes on issues, including constituent input, how the outcome would best serve her state and its interests, and fulfilling her sworn constitutional obligations in a particular area. Pryor’s spokesman, Lisa Ackerman, said that in mid-September, he was the first senator to get legislation passed to essentially mandate the Federal Trade Commission to conduct an investigation into gasoline price gouging through the supply chain and distribution markets. “He’s putting Arkansas’ interests first” despite accepting the contributions, she said. A reader in Fort Smith sends an electronic message inviting me to do something. Actually, I get a lot of messages from readers inviting me to do something. But this qualifies as that rare invitation I actually can relate in a family newspaper. The reader mentioned that Molly Ivins, a liberal columnist from Texas, had described President Bush as "good at politics but lousy at governance." Such a division of aptitudes intrigued the reader. He wondered if I would kindly assess the current crop of Arkansas politicians on that bifurcated basis. I will do so, partly because it sounds like a snap and partly because it might actually be instructive. Running for office and holding office indeed are wholly disconnected roles requiring wholly disconnected talents. What I'll do is give six major Arkansas political figures two letter grades, one for political skills and another for governing skills. Then I'll compile the grade-point averages for each for an overall ranking of effectiveness in the combined roles. I'll not include Bill Clinton, since he's retired, more or less. For the record, he would have received an A for politics and a B for governing. I will, however, include his wife Hillary, since she remains dimly tied to Arkansas and may in fact follow Geena Davis to become our second woman president. -Hillary Clinton, a C for politics, because she's not easily warm and is unproved as a campaigner except in New York, where she enjoyed great natural advantages; and a C for governing that would have been an A based on her intelligent and coalition-building performance as a freshman senator but was brought down by the F she fully earned in the White House with that arrogant, secretive, ham-handed health care debacle. -Mike Huckabee, an A for politics, because he's well-spoken and funny and possessed of a common touch; and a C for governing that averages the A he earned in the state's Katrina response with the D's and F's he gets otherwise for being detached during legislative sessions, turning Wayne DuMond loose and living in a permanently gray area ethically in his acceptance of gifts. -Mike Beebe, who perhaps should get an I for incomplete on politics because he's never had an opponent, but who in these very early stages of campaigning for governor has shown himself good enough at the most important part of politics - raising money - to earn at least a solid C; and, in governing, a B that averages the A's he earned over two decades in the state Senate with the C's he must be assigned for an uneven performance as attorney general. -Asa Hutchinson, a C in politics because, after all, he's run two statewide races and won neither; and a C in governing because, after all, he ran federal government agencies charged with drug and border enforcement, and progress was not reported on either. -Blanche Lincoln, a B for politics because she manages even as a Democrat to stay ingratiated in rural Arkansas, and a B on governing because she has developed through her service on the Finance Committee an actual command of complex issues especially relevant to her underprivileged constituency, such as Medicare, Medicaid, prescription drugs and tax credits. -Mark Pryor, a B for politics that would be an A except that I can't be sure he'd have accomplished as much if he had a different father, and, frankly, an A for governing, solely because of his leadership even as a freshman in forging that centrist coalition known as the Gang of 14 that accomplished nothing less than keeping the U.S. Senate functional. Here, then, are the rankings by grade point averages. 2. (tie) Huckabee, Lincoln, 3.0. Postscript: The state's four members of the U.S. House of Representatives were not included for two reasons: space and that they don't have any actual governing influence in Washington. Gubernatorial candidate Asa Hutchinson made one of what is sure to be many stops in Hope Thursday. Hutchinson, a republican, squares off against democrat Lt. Gov. Mike Beebe for governor next November. Hutchinson touted his leadership ability and economic development plans as reasons voters in Hempstead County should elect him to succeed Gov. Mike Huckaby, a Hope native. Hutchinson's task is large if he plans on carrying the county, particularly since Sen. John Kerry won the county against Pres. 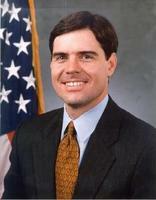 Bush in 2004 and Huckaby lost it in his successful 2002 campaign for governor. Still, he says building on the foundations left by Huckaby is one of his primary goals. He said reconstructing the state's tax system also is important, especially when it comes to keeping business in the state. He said Huckaby laid a good foundation for economic growth and as governor, he'd use the office of the governor as a bully pulpit. Since the state has been trying to fix its secondary and lower education problems, Hutchinson said raising taxes “over and over” again is not the best way to solve the problem. Hutchinson gained national notoriety during former Pres. Clinton's impeachment hearings as a congressman from northwest Arkansas, then moved over to the Drug Enforcement Agency from 2001 to 2003 in the Bush administration, where he touted the fact that on his watch, there was a 13 percent drop in teenage drug use. "And so basically, what it looks like is going to happen is that Libby and Karl Rove are going to be executed because outing a CIA agent is treason, left-wing author and radio talk show host Al Franken asserted Friday night, to audience laughter, on CBS's Late Show with David Letterman. Franken qualified his hard-edged satire: "Yeah. And I don't know how I feel about it because I'm basically against the death penalty, but they are going to be executed it looks like." Franken later suggested that President Bush is at risk of receiving the same punishment, since Karl Rove likely told him what he did, but he added a caveat: I think, by the way, that we should never ever, ever, ever execute a sitting President." commit. His attorney, Rufus, is the only person standing between him and jail time and paying an exorbitant fine. Poor Bob discovers that for years the prosecutor’s office has been making contributions toward Rufus’ third summer home in the Bahamas. OK, it’s not a perfect correlation with what’s been happening between utility companies in Arkansas and the state attorney general’s office. But it’s close enough for me for comparing the conflict in utility companies contributing to the campaigns of our attorney general, who is pledged to aggressively represent the people of Arkansas when those utilities push to raise their rates. Gunner DeLay of Fort Smith, a former state senator and recently announced GOP candidate for attorney general, made a headline out of his related concerns in a story last week. Our reporter Jake Bleed quoted DeLay as saying that he found the practice of utilities greasing the war chests of an attorney general unethical and a conflict of interest. To that I’d only add illogical, unnecessary and plain ole dead-bang wrong. It’s inconceivable to me that this practice would be permitted. The attorney general is our primary line of defense against the natural tendencies of utilities to rake in every cent possible from their captive audiences. Appearances do matter, my friends, and utility companies contributing to the one state official who is sworn to effectively and aggressively question their agendas, motives and requests on behalf of hard-working Arkansans is about as ugly a political scenario as I can envision. Now I am not saying, nor do I necessarily believe, that any attorney general, including the current version, Mike Beebe, a Democratic candidate for governor, has ever been bought off or jumped into the pockets of utility fat cats by receiving their campaign pay-outs. But Republicans certainly have been criticizing Beebe’s handling of consumer rate cases before the Arkansas Public Service Commission. The fact is that it’s wholly irrelevant which political party has the AG in power when the money flows. This is a matter of integrity, credibility and honor. Come to think of it, why does any utility company need to give money to the campaign of a public official, including the governor, who has no adversarial duties where they are concerned ? In us, these companies have a hamstrung audience, even down to those up-front deposits designed to prevent any losses. Should utilities be in the business of spending portions of whatever we pay them each month to curry favor with those who regulate them on our behalf ? If you answered yes, please take three No-Doz tablets to fully wake up, then immediately contact your therapist. Let me know how it comes out. How do you feel about this situation, valued reader ? How you view this situation actually matters most when all the dust from this flap settles. After all, it’s your money on both ends, right ? How does it make you feel, as utility rates continue to climb, to know that a tax-supported public servant who is supposed to represent our interests as an adversary to utility companies also accepts their contributions to help get elected ? Time always tells Those of you who have been patient enough to follow these wide-ranging missives over the years may recall my controversial series of columns on Arkansans who were crippled, suffering or deceased years after their stomach bypass surgeries, i. e., bariatric surgery. It felt sad four years ago to sit beside so many of these suffering people during state Sen. Tracy Steele’s hearings into the issue. Now comes this account from our ace health reporter, Nell Smith : “The rate of death after weight-loss surgery is higher among Medicare patients than previously thought, according to a study [in California ] released Tuesday in The Journal of the American Medical Association.... “ The study found ‘significant and sustained’ increases in the rates of hospital admissions for these patients after surgery. The annual rates of hospital admissions after surgery doubled the hospital admission rates before it, the study said.” Some insurance providers and HMOs, citing potential post-surgical problems, are now declining to cover the major surgery. Any further questions ? Over the last couple of weeks The Truth has decided to make a few changes in the appearance and the method in which we post. We will be posting more political commentary and news information. We will be posting frequently, so please continue to visit often. We have enabled comments once again and we ask that people respect our policy regarding offensive content. Any post that is inappropriate will be removed. Let us know what you think about our new look. The comments posted on The Truth blog do not represent the views of the owners. Mr. Smith, perhaps you should have covered all your bases and checked the reports of the Democrat office holders. Since Mr. Smith did not, The Truth decided to take a look and I think everyone would be interested in the results. It seems that one Blanche Lincoln, just in the 2004 cycle received a total of $4,000 from ExxonMobil Corp. PAC. $2,000 on 9/28/2004, $1,000 on 10/29/2003, and $1,000 on 5/15/2003. Not only did Blanche receive contributions from ExxonMobil she also received a total of $3,000 from Shell Oil Company PAC. $1,000 on 6/24/2004, $1,000 on 4/27/2004 and $1,000 on 12/04/2003. Wait a minute, not only did she receive the $7,000 from Exxon and Shell, she also received a total of $10,000 from Murphy Oil Corp. PAC in 2004. Now the Washington County Democratic Committee is running a radio ad against John Boozman for not representing the Arkansas people and accepting a $1,000 dollar donation from Exxon, when in the 2004 cycle alone Blanche accepted $17,000 from oil/gasoline companies? If this is not hypocrisy I don’t know what is. The Democrat party is looking for anything they can find to discredit and attack John Boozman, but they will not succeed. I think Arkansans need to decide who is representing them better when it comes to gasoline prices, John Boozman who accepted $1,000 from Exxon or Blanche Lincoln who accepted $17,000 from Exxon, Shell and Murphy oil in the 2004 election cycle? Mr. Smith why did you not include these figures in your ad? I think Jason Willett needs to have a talk with his leadership around the state and tell them to check all the facts before making accusations. Correct if I am wrong Drew, but doesn’t Blanche represent the 3rd district as well? I would say she most certainly does. Today, we -from DraftWesleyClark.com and DraftClark2004.com -- are writing you, our friends and allies, in a way that we have never written before. Together. We write because we believe that, having worked together to fashion the new foundation of modern democracy, we have an obligation to build upon and solidify that foundation. We believe Bill Halter represents another opportunity to do just that. 2. He’s honorable. 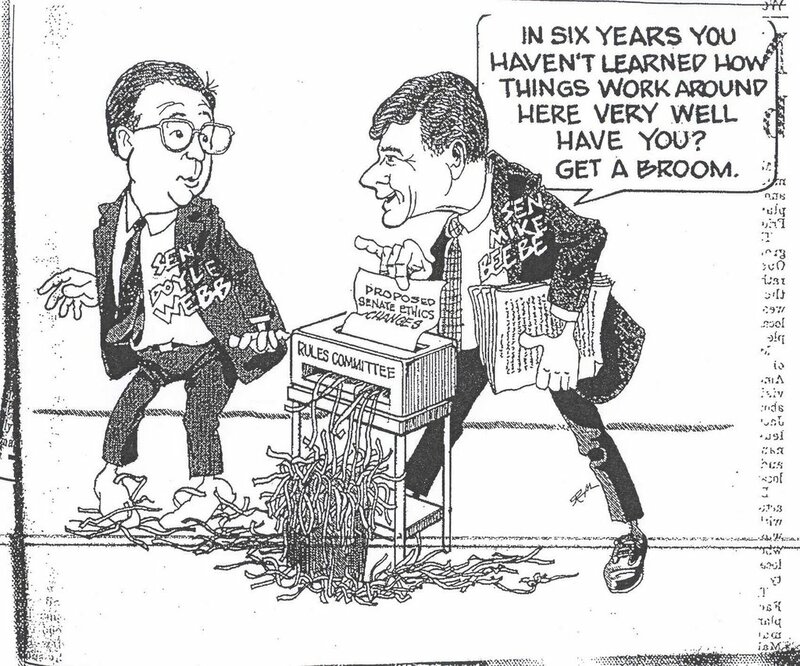 Many of us watched him- “scrutinized” is a more accurate term -when he served the Clark campaign, and what we (to a person) can tell you is this: what Bill Halter says, Bill Halter does. He “walks his talk” and, in a profession in which talk is usually cheap and meaningless, Bill’s words count. Honor is rare, but important. Bill has it in big quantities. 3. He’s forward-looking. Too often, as most of us know first-hand, those in public office tend to tread only the paths they’ve trodden before. They cover well-known and familiar ground, and leave to others the “undiscovered country.” But Bill is a leader in every sense of the word, and that means he’s confident enough to take risks when those risks might yield rewards. And, finally, there is this: Bill can win. And he will. He will beat Asa Hutchinson for the race to occupy the Governor’s Mansion of the State of Arkansas. He will answer decisively the question of whether the forward-moving vision of Clinton-era Democrats was an aberration stopped cold by partisan politics, or whether our country, starting in races local and statewide, can regain the momentum that the last “Bill from Arkansas” gave to us all…. 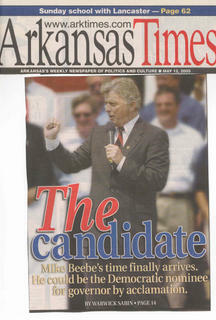 Was Beebe caught in a flat-out lie in Saturday’s front page ADG story? He is quoted as saying that he hasn't taken a contribution from Entergy since he took $100 back in 1998. This is absolutely untrue, as even his own campaign finance reports show. From the ADG story: "He [Beebe] said the last donation he received from Entergy was $100 in 1998, when Beebe was a state senator. According to filings made by Beebe’s campaign with the Arkansas secretary of state, the attorney general took money from several contributors who work for companies regulated by the commission. That includes a $500 donation by Paul Means Jr. of Little Rock, who is described in Beebe’s filings as a lobbyist for Entergy." The article did not even mention the thousands received from relatives of Tom Kennedy (Entergy lobbyist). In fact, one of the donations ($1,000) was from Kristin Kennedy (wife of Tom Kennedy). Mike, you need to start telling The Truth. [H]e said the last donation he received from Entergy was $100 in 1998, when Beebe was a state senator. According to filings made by Beebe’s campaign with the Arkansas secretary of state, the attorney general took money from several contributors who work for companies regulated by the commission. Entergy has filed a letter with the Arkansas Public Service Commission declaring their intent to ask for a 6% rate hike on the backs of consumers. According to Entergy, “[t]his typical bill would increase from $89.73 to $95.08.” This would affect nearly 430,000 customers. According to a letter from Entergy, this 6% rate increase took effect on October 1st. The Consumer Advocate, Mike Beebe, did not inquire to the PSC on this matter until October the 4th. Here is a copy of the actual Arkansas statute regarding the role of the Attorney General in regards to consumer utility rates:23-4-303. Office createdThere is created within the Office of the Attorney General a Consumer Utilities Rate Advocacy Division.23-4-305. Functions; powers and dutiesThe Consumer Utilities Rate Advocacy Division shall represent the state, its subdivisions, and all classes of Arkansas utility rate payers and shall have the following functions, powers, and duties:(1) To provide effective and aggressive representation for the people of Arkansas in hearings before the Arkansas Public Service Commission and other state and federal courts or agencies concerning utility-related matters;(2) To disseminate information to all classes of rate payers concerning pertinent energy-related concepts; and(3) To advocate the holding of utility rates to the lowest reasonable level. Beebe said his law firm (Lightle, Beebe, Raney, Bell and Simpson) has represented Entergy and its forerunner Arkansas Power and Light (AP&L) in local matters (Copyright 1999 Little Rock Newspapers, Inc., Arkansas Democrat Gazette, March 15, 1999). This disclosure came as the Arkansas Senate began consideration of deregulation of the electric utility industry. The “Entergy” Bill was sponsored by Mike Beebe’s good friend, Tom Kennedy, now Vice President of Entergy. More on Tom Kennedy in our next installment! The Truth would like to begin this deep exploration with a few simple questions? How long was Mike Beebe on retainer with Entergy/AP&L? Is Beebe’s former law firm still on retainer with Entergy? What other companies did Beebe’s law firm have on retainer that may present a conflict of interest while Beebe was in the Arkansas Senate? “The flipside of that practicality, according to a longtime Senate expert who asked for anonymity in this article, is that Beebe was timid about being the primary sponsor of controversial legislation, voted for politically expedient bills, and accepted the ethically questionable culture of the Senate, even if he personally stayed clean. For instance, the observer said, Beebe would often join his fellow legislators for golf outings sponsored by lobbyists. Beebe paid his own way, but his colleagues would accept the freebie. It is that kind of tightrope-walking that led Beebe to be called to testify in the 1997 federal prosecution of senators who created a kickback scheme utilizing state programs. Beebe claimed ignorance about their actions, even though he was running the Senate as president pro-tempore at the time and the common understanding was that nothing passed the Senate with at least his tacit approval. Beebe’s coziness with business and other special interests is well-known, but not easily quantifiable. His defenders say that such relationships are impossible to avoid as a legislative leader – after all, the lobbyists make a point of ingratiating themselves with anyone in a position of influence. Do Arkansans deserve a leader who will be timid about putting forth controversial legislation or politically expedient legislation, and accept the ethically questionable culture of the Arkansas legislature? Mike Beebe, it is time you come clean. Who are all of these other businesses that had little or no business in Searcy who kept you on retainer? Please, do tell. Let us begin the process by taking a look at Entergy and your good friend Tom Kennedy. It's good for Mike Beebe that the governor's race hasn't really started. Otherwise Asa Hutchinson and the Republicans might have been awarded a technical knockout. Hutchinson's main concern ought to be peaking too early. If the Republicans have even better punches in store for the anointed one, then Democrats probably ought to take another look at Bill Halter. All Beebe has done so far is raise big bucks that make him vulnerable to ethics questions. Otherwise he hunkers in a bunker, cowed by his job as attorney general. That office didn't seem nearly so politically imprisoning when Bill Clinton used it to step up to governor. But these are different times. The Republicans are competent now. They're effectively keeping Beebe in the attorney general's box. And they're portraying him as a cozy colleague of the moneyed special business interests. Admittedly, there's a certain typecasting to that. The constitutional duties of attorney general require Beebe to defend an often indefensible state Legislature, such as on school funding and the petty and irresponsible spending of surplus money for local pork. They require him to stand by formal opinions issued by his staff that constrain his ability to exploit issues. Paramount among those is the recent U.S. Supreme Court ruling allowing in some instances the use of eminent domain to take private property for nonpublic purposes. Beebe must honor his office's perfectly reasonable formal opinion that the state Constitution exalts private property rights above all others and therefore renders moot any threatening implications for private property in Arkansas. But Hutchinson, quite possibly the best and smartest and most palatable of the far-right Arkansas Republicans, is telling anyone who'll listen that there are constitutional gray areas and a couple of credible threats to private property in Arkansas. He vows he won't rely passively on an arguable constitutional interpretation, but move aggressively as governor to enact legislation to keep greedy developers from gobbling up our land and our homes. Meanwhile he has seized the education issue, criticizing the Legislature's underfunding of schools. Hutchinson also has attacked pork. Beebe's office must defend both those outrages in court. A Democrat who finds himself on the short end of greedy developer rhetoric to a Republican is a rare Democrat indeed. Ditto a Democrat who finds himself on the short end of education rhetoric. Ditto again one who finds himself on the short end of responsible spending rhetoric. Beebe's calling card - that he is a Democrat with business support, so much so that he could a raise a million dollars in a month - has been turned against him. This probably isn't a serious problem, since the money will allow him to buy advertising later changing the subject, maybe to Hutchinson's brazen cashing in on his service in the federal Department of Homeland Security. But Republicans scored ethical points last week. They pointed out the tens of thousands Beebe has taken for his gubernatorial campaign from regulated utilities even as the office of attorney general often intervenes in supposed behalf of ratepayers in regulatory matters. A Democrat who finds himself on the short end of pro-consumer rhetoric to a Republican is a rare Democrat indeed. Less relevant are these right-wing Web logs set up by Republican attack dogs to augment the Hutchinson campaign and beat up Beebe. Only about a dozen of us are reading those, probably. They're effective only if they get cited in the mainstream media. And I seem to have just cited them. 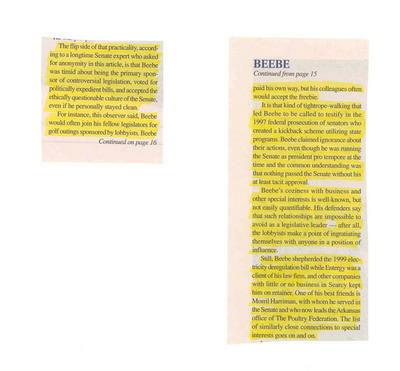 One of these blogs has posted a newspaper column from 1999 that chastised Beebe, then the leader of the state Senate, for golfing in Tulsa with Southwestern Bell's lobbyist shortly after the Legislature passed telephone deregulation legislation favored by Southwestern Bell. The column was unimpressed that Beebe, unlike a half-dozen other Senate colleagues on the trip, insisted on paying his own way. It said he shouldn't have engaged in the fraternization in the first place, because of the appearances. Modesty prevents me from saying what a fine column that was. State Sen. Mike Beebe of Searcy golfed Thursday with Bill Clinton out at Chenal. Perhaps the president advised him between mulligans on how to overcome overwhelming political odds and withstand the innuendo of scandal based on peripheral associations. The latest legislative outrage -- the most recently exposed insiders' raid on your money -- has worrisome implications for Arkansas Democrats who were beginning to sidle up to Beebe as their challenger to Gov. Mike Huckabee's election next year. Beebe has formed a gubernatorial exploratory committee, raised a lot of money swiftly in $ 100 increments and won a thoroughly favorable front-page biographical article in the statewide press. But now comes Lawyergate, advancing the personable litigator to an upper-level course in the perils of electoral politics. That Beebe is probably specifically innocent is nearly beside the point. It may not be fair that now he'll have to run with Nick Wilson and Jim Guy Tucker around his neck. But we're talking about politics after all, and fairness doesn't apply. Beebe is embedded in the periphery of disdainful behavior, and the perception is ripe for exploitation. 1. Some Democratic legislative insiders cozy with Wilson, the official state rascal, got caught pushing through a measure they then abused to route absurdly lucrative contracts for representing children in chancery court custody cases to a pair of legislators, a lobbyist who formerly was Tucker's top aide and a former legislative staff lawyer. Beebe's best pal, Sen. Morril Harriman of Van Buren, sponsored one of the bills that got abused. Another of his pals, Sen. Steve Bell of Batesville, who formerly handled Tucker's legislation, prepared the incorporation papers for two of the abusing insiders. 2. Huckabee is milking for all it's worth his innocent outsiderism against these greedy maneuvers of Democratic legislators. Huckabee can boast, and ought to boast, that he vetoed an element of the bill setting up this spectacularly abused appropriation. The Democratic Legislature overrode his veto. Beebe voted to override after Wilson urged his Senate colleagues to join him in doing so. 3. Beebe is often described as an insider's insider at the Legislature -- as, in fact, the most accomplished and effective member therein. His command of legislative detail has been extolled in this space and elsewhere, nearly universally. His choices are to plead innocent in the aforementioned shenanigans and appear less the wise, savvy, all-knowing legislator, but one oblivious to this scheme and perhaps others, or to assert his legislative competence and vitality, in which case he would need to explain his acquiescence to such a disgrace. I can hear the Huckster now in a debate: "Senator Beebe, it says in the paper that you run the Legislature. Lord knows I don't have any influence down there. I'm just trying to get you to own up to your press clippings. And then you might be so kind as to explain to us how you and Senator Wilson and assorted former allies of Jim Guy Tucker managed to feather the nests of pals to the tune of $ 750,000 by abusing a program designed for kids, for kids, even after I tried to do the right thing by vetoing this outrage." Beebe could answer, if he could still draw breath, but it'd take time and he'd need to trash a few Democratic colleagues in the process. He could begin by explaining that he could spend all his time keeping up with Nick Wilson's machinations, or he could try, as he did, to work with Wilson as much as possible on such vital matters as schools and human services in the absence of strong gubernatorial leadership from the neophyte Republican. He could explain that he led the way for a vital override of Huckabee's nonsensical veto of a provision in the school funding bill requiring minimal equity, and that Wilson backed him, and that he went along when Wilson asked for an override of Huckabee's veto of an arcane provision in a harmless-sounding measure. Beebe could say quite correctly that the real scandal was not in the legislative enactment of a worthy program, but in the wholly unaccountable way the Supreme Court's administrator disbursed three quarters of a million dollars apparently on orders of a legislator who got a cut from one of the contracts.